Homegrown food from your own garden is the most delicious way to feed your family. Gardening is nourishing for body and soul. If you have a green thumb (or always wanted to! ), raised bed garden kits are a great way to get started growing your own food without too much hassle. Raised bed gardening is a great option for those living without a yard, for those with a yard with potentially contaminated soil, or if you’re not able to dig in your yard (if you have a rental, for example). Raised beds offer lots of benefits to the home gardener, especially newbie green thumbs. The soil can be amended quickly for optimum nutrition, plants are less likely to be bothered by pests, and will often be healthier in raised beds. 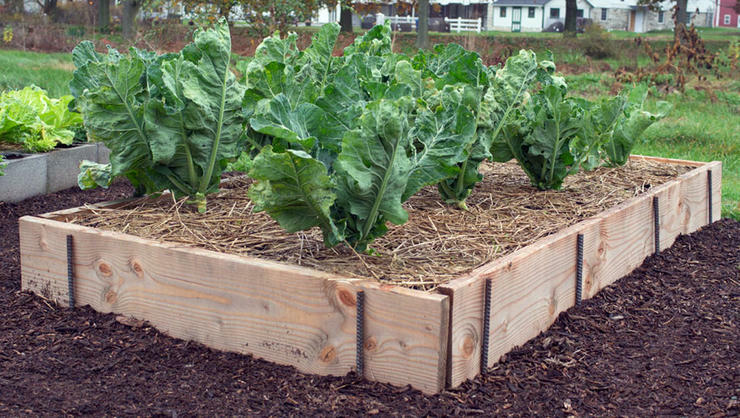 Ok, you’ve decided to grow your harvest with raised beds, but where to start? Sure, you can build your own raised bed, but what if you’re not the DIY-type? Never fear, there are lots of raised bed gardening solutions for those without construction skills. You can find ready-made raised bed garden kits across the web, and we’ve poked around and found the most sustainable raised bed kit options for you and your (new) green gardens. 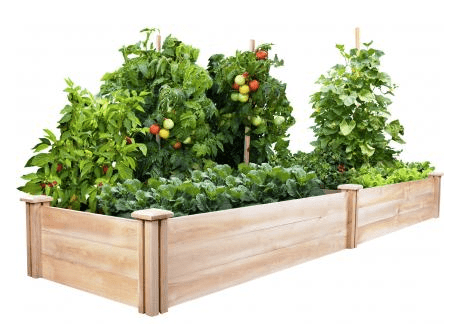 There are lots of options out there for the aspiring grower, but here are some things to consider before choosing your raised bed gardening kit. 1. What type of Wood? 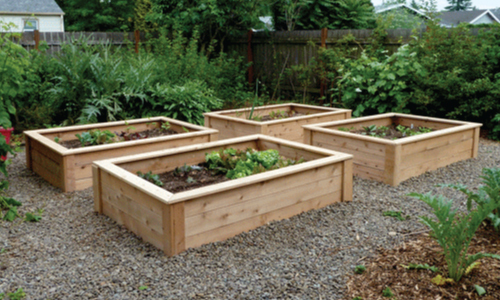 Most raised bed garden kits are made from wood, for a rustic and beautiful look. But make sure the wood used has not been chemically treated, or if it has been treated, that is has used food safe treatments that are safe for organic gardening. Most raised beds will be made from cedar, which is naturally pest- and rot-resistant. Other woods are fine, but make sure they are not treated. 2. Find Sustainable Wood: Look for Forest Stewardship Council (FSC) certified wood to ensure that the materials were harvested safely and sustainably, leaving forests for future generations. 3. What about Other Materials? Other than wood, you can find garden kits in vinyl, plastic or stone. We recommend avoiding all plastic and vinyl, as these can be difficult to recycle and may leach chemicals into the soil. Avoid any composites of plastic and wood (like the kits from Lowes), since these are neither compostable nor recycleable. Farmer D makes gorgeous, US-made FSC certified wood planting boxes that are good for all spaces and places. The wood is all 2”-thick FSC-certified sustainable untreated western red cedar that is naturally rot- and insect-resistant. You can find Farmer D products at Williams-Sonoma, Houzz, Amazon, and elsewhere online. Also, this Farmer D guy seems pretty dang cool! The whole line of Farmer D products is sustainable, gorgeous and practical. Urban Farmer is a great go-to garden website for seeds, tools and raised bed kits. They have two main types of options– one for ground-level raised beds, and another for a standing planter. These standing planters are great for those with mobility issues. At 34″ high and with an optional bottom shelf, it works for lots of range or for houses without a lot of yard space. Find standing planters here and all the sizes for the raised bed kits here. Both planter options are made from durable cedar protected by a non-toxic waterproof sealant that is safe for vegetable gardening, and include a 15 year warranty. Greenes Fence is another brand making a range of raised garden bed kits, all made in the US. While they use chemical free cedar, they are not FSC certified. They offer an affordable cedar beds and a line of premium cedar beds. Home Depot carries the Greenes Fence line of products, and you can also find them at their online store. Another option for raised beds of all shapes and sizes is Veg-Trug, makers of all things for the garden. They have dozens of options for raised bed garden kits. Some of the kits are made from 100% FSC Plantation Cedar Wood, other from sustainable plantation grown fir, and other items do not list the construction materials. Country of origin is listed as China on outside sites, but not listed in the product specs on their own site. You can find Veg-Trug products at Williams-Sonoma and elsewhere online. Gronomics is another good brand that makes a range of cool raised bed garden products in a huge range of sizes. Their garden beds are made from 100% Western Red Cedar and handcrafted in the USA, and are available unfinished or food contact safe finish. You can find Gronomics products at Williams-Sonoma, Target, Amazon, Home Depot, and on their online shop. 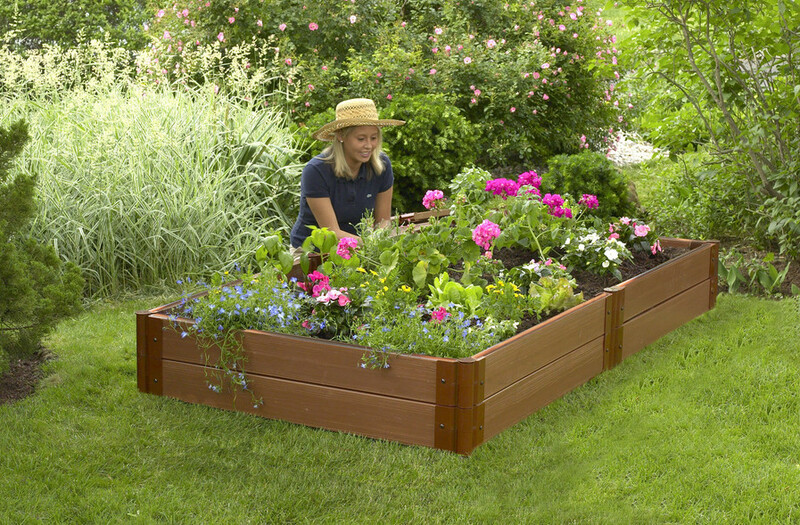 Home Depot is a great option for finding raised bed garden kits. Their lumber is all chemical-free and naturally rot- and insect-resistant cedar. They have a huge selection of sizes and options, and they offer other materials for garden beds too, including bricks, ledgestone, concrete and more. They also offer plastic and vinyl options that are not recommended, as the plastics are made from petrochemicals, are likely to degrade, and can be difficult to recycle. Lowes offers a good variety of raised bed options, but all of their choices seem be made of composite material consisting of 38% post-consumer recycled plastic and 62% sustainable wood fibers. They claim this product is low maintenance and will not rot, warp, splinter or fade. While this sounds like a great composite, it actually means that this product is landfill bound– products made from both wood and plastic cannot be recycled OR composted. If you choose not to do wood and have to choose plastic, at least choose a fully plastic option that could be recycled at the end of its life. The composite raised garden box from Lowe’s; the least sustainable choice.